After his promotion to full-fledged reporter, Jimmy Olsen is assigned to help break in new cub reporter Hazel Powell. Her klutziness exasperates him, but it also inadvertently protects him from the efforts of three syndicate hitmen out to kill him. The Secret Of Jimmy's Lost Father! 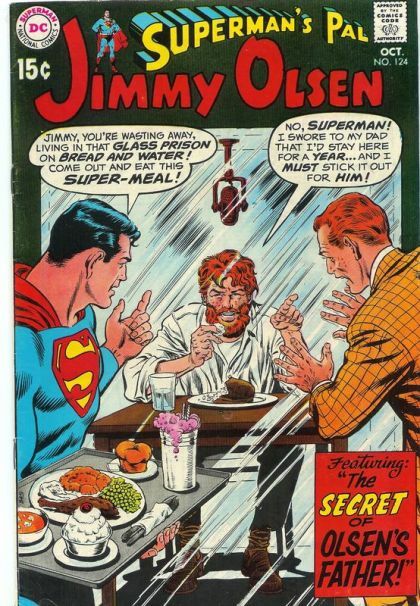 The man who claims to be Mark Olsen tells Superman the reason for his and Jimmy's imprisonment: he was cursed by a priest of Kukulcan while on a dig in a temple in Yucatan, Mexico, to have the body of a serpent unless he or his son spent five years in imprisonment, eating only simple food. However, it turns out that “Mark Olsen” is really Hal Rand, the real Mark Olsen's partner, and that a dynamiting accident at the dig gave him amnesia and made him think he was Olsen. Superman restores Rand's memory and, since they deduce the priest's curse was an illusion, they liberate Jimmy from the isolation booth. Rand offers to adopt Jimmy as his son, and Jimmy agrees.